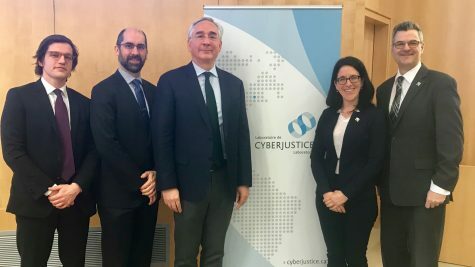 On Monday, April 1, 2019, Sonia LeBel, Minister of Justice of Quebec, and Éric Caire, Minister for Government Digital Transformation, attended a presentation of the Cyberjustice Laboratory by its Director, Professor Karim Benyekhlef, as well as Professor Nicolas Vermeys and Valentin Callipel. The session focused on the technological tools developed by the Laboratory, which are: the PARLe platform, the JusticeBot conversational agent, and the major research project Autonomy through Cyberjustice Technologies and artificial intelligence (ACT), in which the Ministère de la Justice du Québec is a partner. This six-year project, which began last year, includes the development of guides to good practices and the formulation of a governance framework to ensure that artificial intelligence tools are used in the judicial and administrative system in a manner consistent with the fundamental rights of the province's citizens. During this exchange, Minister LeBel expressed interest in the online dispute resolution platform PARLe, particularly its efficiency and speed in resolving disputes out of court. She also praised the Laboratory's team for its recognized expertise and scientific approach, combining socio-legal research and technological developments. Minister Caire welcomed Montréal's position as a hub at the forefront of artificial intelligence research, and the participation of the Cyberjustice Laboratory in this development. The ACT partnership aims to put artificial intelligence at the service of judicial actors to improve conflict prevention and resolution. AJC brings together a team of 45 researchers and 42 partners representing: the best global research centres dedicated to the introduction and use of technologies in the field of justice (cyberjustice); litigants and legal professionals (judicial actors); and the main users and developers of AI for justice in Canada.